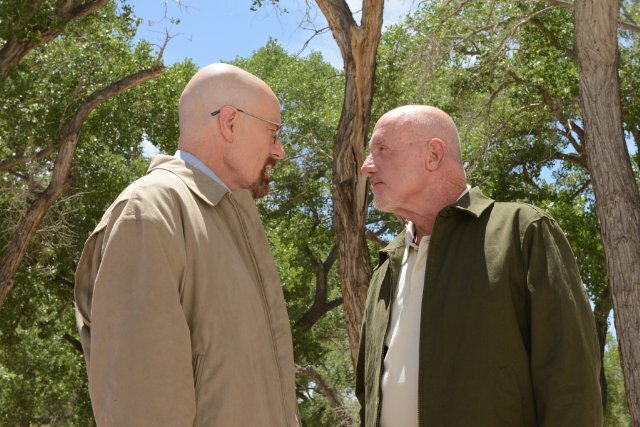 After some of the scenes they shared in the first eight episodes of AMC’s fifth and final season of BREAKING BAD that aired this summer (with the final batch not showing up until next year, unfortunately), Bryan Cranston and Jonathan Banks are getting the chance to shine with some lighter, brighter material for the Peacock. Remember all those times on 30 ROCK when Kenneth tells uncomfortable stories about “my mom’s friend Ron” that are hilarious only to us? We’ll meet his mom’s “friend” Ron on tonight’s episode, and he’ll be played by … Cranston! Cranston, of course, is no stranger to being funny, having done memorable work as Jerry’s dentist, Dr. Tim Whatley, in a handful of episodes of SEINFELD, followed by a long run as the dad on the Fox comedy MALCOLM IN THE MIDDLE. Equally excellent is the casting of comedy queen Catherine O’Hara as Ron’s “friend,” Kenneth’s mom. TV Guide was the first to report the news, with TV Line debuting the first clip earlier this week. And this isn’t the only gig Cranston’s had at NBC lately; he recently directed an episode of THE OFFICE called “Work Bus” that airs next Thursday, October 18. You can read a great interview over at CTV where he talks about what he’s been up to as BREAKING BAD winds down. Schur is a huge BREAKING BAD fan, as are the rest of his writers. I blanked out Sepinwall’s link about his interview with Banks in the quote above because it contains huge BREAKING BAD spoilers in its title alone. If you’re all caught up on the show, you can read it here, but don’t go near that link if you’re still catching up on DVD or DVR. I love 30 ROCK and PARKS, and anything that gets these guys on TV while I’m waiting for the last eight hours of BREAKING BAD is fine with me. And don’t forget to catch Cranston in Ben Affleck’s ARGO, which opens this weekend!